The attack on the Israeli-occupied Golan Heights, just past midnight, marked the first time Iranian forces have hit Israel from Syria. Jerusalem/ Beirut: Iranian forces in Syria launched a rocket attack on Israeli army bases in the Golan Heights early on Thursday, Israel said, prompting one of the heaviest Israeli barrages in Syria since the conflict there began in 2011. The attack on the Israeli-occupied Golan Heights, just past midnight, marked the first time Iranian forces have hit Israel from Syria, where they have deployed along with Iran-backed Shi’ite militias and Russian troops to support President Bashar al-Assad in the civil war. Syrian state media said dozens of Israeli missiles hit a radar station, Syrian air defence positions and an ammunition dump, underscoring the risks of a wider escalation involving Iran and its regional allies. Israel said 20 Iranian Grad and Fajr rockets were shot down by its Iron Dome air defence system or fell short of the Golan targets. The Quds Force, an external arm of Iran’s Revolutionary Guards, carried out the launch, Israel said. “It was commanded and ordered by (Quds Force chief General) Qassem Soleimani and it has not achieved its purpose,” military spokesman Lieutenant-Colonel Jonathan Conricus told reporters. Israel struck back by destroying dozens of Iranian military sites in Syria, Conricus said, as well as Syrian anti-aircraft units that tried unsuccessfully to shoot down Israeli planes. “We do not know yet the (Iranian) casualty count,” he said. The Israelis fear that Iran and its Lebanese guerrilla ally Hezbollah are turning Syria into a new front against them. Israel says its occasional strikes in Syria aim to foil that. Iran vowed retaliation after a suspected Israeli air strike last month killed seven of its military personnel in a Syrian air base. Israel regards Iran as its biggest threat, and has repeatedly targeted Iranian forces and allied militia in Syria. Expectations of a regional flare-up were stoked by US President Donald Trump’s announcement on Tuesday that he was withdrawing from the Iranian nuclear deal. 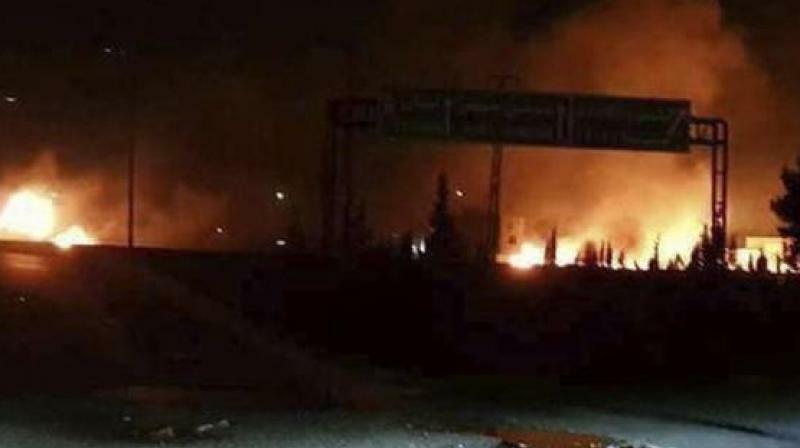 Hours later, Israeli rocket rockets targeted a military base in Kisweh, a commander in the pro-Syrian government regional alliance said. The Trump administration cast its hard tack against the Iranian nuclear deal as a response, in part, to Tehran’s military interventions in the region. The Golan flare-up with Israel “is just further demonstration that the Iranian regime cannot be trusted and another good reminder that the president made the right decision to get out of the Iran deal,” White House press secretary Sarah Sanders told Fox News. The tensions worry Russia, which wants to stabilize Syria. Thursday’s flare-up came hours after Israeli Prime Minister Benjamin Netanyahu returned from a visit to Moscow, where he discussed Syria concerns with Russian President Vladimir Putin. Conricus said Israel forewarned Russia of its strikes on Thursday, which Syrian state media first reported hit Baath City in Quneitra, near the border. Further waves of missiles followed. Syrian state media said Israeli missiles had been brought down over Damascus, Homs and Sueida. Syrian state television was broadcasting footage of its air defences firing, and playing patriotic songs. Damascus residents described explosions in the sky from air defence systems. Lebanon’s National News Agency reported Israeli jets circling over Lebanese territory early on Thursday before exiting.